JACK HENDERSON CLEMENT - Jack Clement is one of the few people associated with Sun Records who are more famous for what they did after the Sun years than during the heyday of rockabilly. Clement is a highly talented record producer, musician, occasional recording artist and genuine "character", known as "the minstrel", or "cowboy". Clement had made his name largely in country music, discovering Charly Pride and Don Williams and delivering their music to a world audience. Jack Clement played an important but, for him, subordinate role at Sun Records between 1956 and 1958 as songwriter, studio engineer and musical catalyst. Through this time, he was constantly at odds with Sam Phillips about wanting to "develop" the Sun sound, to make it more "musical". It is entirely possible that Johnny Cash would not have broken through to the pop market in such a big way without Jack Clement. Born in Memphis in 1931, Jack Clement lived there until 1948 when he signed up for a four year stint in the U.S. Marines. At home, he'd loved music of all kinds but especially the radio broadcasts of Roy Acuff and Merle Travis. The guitar wizardry of Travis taught him that music could be either simple or complicated but that it had to be good. He would never tolerate second-raters even when recording the simplest of three-chord rockers. He couldn't get to see Merle Travis perform, but he did go down to Smilin' Eddie Hill's "High Noon Roundup" show which took place in a Memphis department store window every day and went out over radio station WMC. He would join the crowd around the store and listen to Hill, Harmonica Frank, Slim Rhodes, Wayne Raney and the Delmore Brothers, and especially to the Louvin Brothers' light harmonies and plaintive hill-country songs. In Jack Clement's view, Sun was not making records quite musical enough. He was responsible for getting Johnny Cash into the pop market and for trying a range of experiments with vocal backings and steel guitar sounds. What he did like at Sun Records was firstly the depth of talented artists, and secondly the relaxed atmosphere. He could do what he liked. Work all night on a session, write songs in Taylor's Cafe next door, like Cash's "Guess Things Happen That Way", and even built a bathroom in the control room. He once told Sam Phillips he could build an office for promotion girl Barbara Barnas for a hundred dollars. He cancelled sessions and set to with the woodwork. He also spent time helping to master recordings for his buddies on rival labels, and on developing his own musical sound as a performer. On April 16, 1954, Jack Clement met Elvis Presley at the Eagle's Nest, and Elvis Presley made one unadvertised appearance with Clement at the Bel-Air Club in Memphis. Leaving Sun Records early in 1959 with his part in a string of million-selling productions behind him, Jack Clement used the proceeds of his song copyrights to buy equipment and set up Summer Records on Main Street in Memphis. Apart from an atrocious novelty called "Motorcycle Michael", Summer bombed. Jack Clement kept busy, though, fooling around with productions for Pepper Records (Tommy Tucker's "Return Of A Teenage Queen") and for Echo Records, which he formed with Stanley Kesler and Clyde Leoppard and for which he built a studio on Manassas Avenue in Memphis. In the fall of 1959, Jack Clement had blown all his money and, in his words, "decided I had to do some work". He called Chet Atkins in Nashville and was hired as RCA's most junior producer. Jack Clement still works as a producer in the Nashville production area. 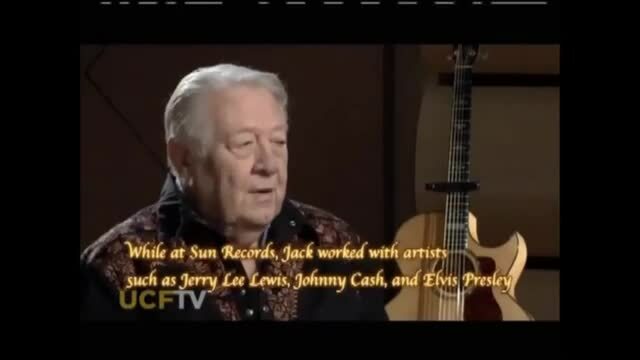 On April 10, 2013 it was announced Jack Clement would be inducted into the Country Music Hall of Fame. A virtual jack of all trades in the entertainment businesss, Cowboy Jack Clement, 82, died Thursday August 8, 2013 at his Nashville home following a lengthy illness from liver cancer.